Many people dread long and hard turbo sessions on the bike. They just feel so much harder than outside! Why is that? There are different reasons and the monotony of going nowhere is the obvious one. Still, I believe there is another factor that is making a bigger contribution to the bucket of pain. That is heat. Humans exist as species due to our excellent abilities to regulate heat. At 42 degrees we are at risk of frying the cells in our brain, so the body ensures to keep itself well below that limit. With training and heat adaptation it has been measured temperatures up to 41 degrees at super hard and relatively short efforts like 5 km races. More than that and you pass out. Most people are not getting close to that limit. What is the limiting factors of performance is not 100 % known, but Tim Noakes Central governor theory give some ideas (Alex Hutchinson’s book Endure is a great read about the subject). The theory is that the brain, aka Central governor, ensures that the body cannot maintain a physical intensity that it threatens the body´s homeostasis (temperature, fluid balance, salt balance etc). By talking all the inputs like heat, humidity, temperature increase etc. into account the Central governor adjusts the muscle recruitment to be able to push as hard as possible without killing yourself. It has built in a reasonable margin to that limit. For that reason, you are not able to push as many watts in hot conditions. This happens already at the beginning of training before the core temperature has increased or fluid balance is lost. The more watt you can push during the hard sessions, the better the training will be (over-simplified said but still). To get the most out of your turbo sessions you should make the conditions as good for performance as possible. And for that reason, get a really big fan. Go for the industrial versions. 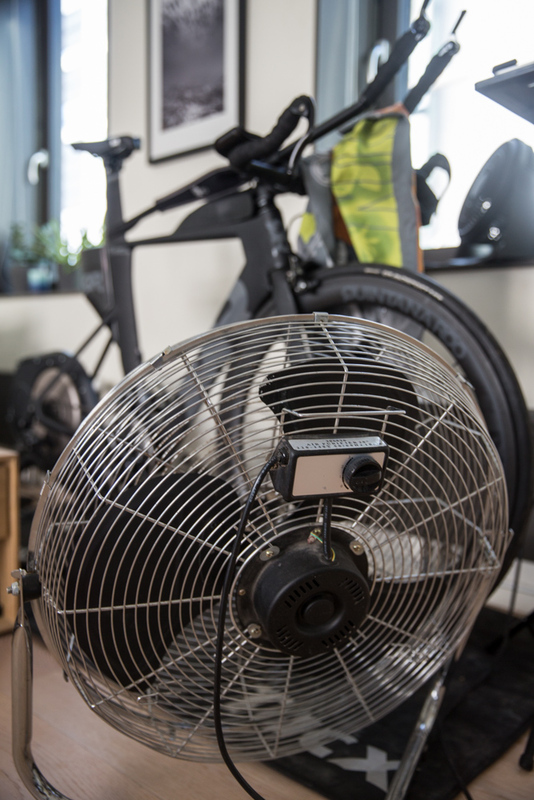 I have a small 25-watt fan for the easier sessions or in the recovery between the hard intervals and then I got a 180-watt fan when things are starting to get hard. I also go the option to open the window and doors to the terrace wide open to really get the optimal 7-13 degrees Celsius performance temperature. Another hack is to have two 0,5 l frozen bottles and hold them in your hands in the rest periods to decrease your core temperature faster. A third on is putting icy water over your head, which also makes the effort easier with an instant as you trick your brain to enable more muscle recruitment. Another hack is to have a on/off switch in reach if you want to turn off the fan during the rest periods. There is always the possibility to go for fancy solutions like wifi-plug to the fan which you can control from your phone but I found this very simple solution to be both cheap, effective and reliable. Any other hacks I forgot? Please drop them in a comment below.